Bookshelves and art galleries alike hold works curated by artists known equally for their mental health as well as talent. From Vincent Van Gogh to Virginia Woolf, there is a well-documented relationship between mental illness and creativity. It’s not just historically esteemed artists that display this link: art therapies are increasingly used as part of patients’ care in mental health recovery, or to help survivors of trauma to express their feelings. The power of art – whether that is knitting words together on a page, or splodges of paint across a canvass, and everything in between – can’t be understated. Yet we must also take care in talking about this link: an illness should never be something to covet in the name of artistic improvement. Mind, an English and Welsh mental health charity, explains that ‘the aim [of art therapy] isn’t to produce a great work of art, but to use what you create to understand yourself better’. Art therapy is accessible in some areas on the NHS, through charities, or privately. One of these charities is The Hospital Room, who decorate mental health wards with artworks, and run workshops for patients to explore a creative outlet during periods of illness or crisis. The Teapot Trust, a Scottish charity, offers similar programs, but to children with chronic illness. While these children may not be suffering from a diagnosed mental health condition, through art, ill children and their siblings can better understand and express their emotions while dealing with a scary illness or overwhelming emotions. It’s not just formal art therapy that helps either; illustrator Ruby Elliot, known online as Rubyetc, often posts brief doodles about her life and experiences on social media. She has since garnered a following of over 60,000 fans on Facebook alone; her artwork is not only cathartic, but relatable to others. Her funny and honest scribbles about life with bipolar disorder are a ‘relief’ for Elliot, again suggesting the usefulness of art –in structured therapy, or in the comfort of a private sketchbook – to those struggling. Perhaps the most powerful thing about – formal or otherwise – art therapy is that there’s no right or wrong answer. Like emotions, art cannot be pinned down. Art offers a subjective and non-judgmental space that can be potentially life changing for somebody struggling to understand how they feel. A 2015 Icelandic study suggests that this link between creativity and mental health can be traced back to our DNA – genetic factors suggest that those in ‘creative’ jobs are 25% more likely to have bipolar disorder or schizophrenia than jobs deemed ‘less creative’. The study also concludes that this is not at all a strong link: it accounts for less than 1% of variation in creative ability. Kari Stefansson, co-author of the study, commented that ‘to be creative, you have to think differently […] and when we are different, we have a tendency to be labelled strange, crazy and even insane’. It’s attitudes like this that can be harmful: not all people with mental health problems are artist, and not all artists have mental health problems. Untreated mental illnesses can carry symptoms such as finding no pleasure in things you once enjoyed (depression), difficulty concentrating (bipolar disorder) or disturbed sleep (post-traumatic stress disorder), to name a few, and without allowing for overlap. Without disregarding those who are able, and based only on the descriptions of symptoms, it would seem almost impossible to be creative at the height of a mental health crisis. For those who seek solace in art on a personal level, I cannot and will not deny the power of it. However, I also believe it’s misguided – and potentially dangerous – to describe those with mental health difficulties as ‘different’, as if that difference carries automatic artistic prowess. While some of artistic greats did suffer from mental illness, it’s not only them. Winston Churchill, a politician, famously described his depression as a ‘black dog’; Princess Diana had an eating disorder. Mental illness does not discriminate. If art can be created from the ashes: brilliant. If art, of good quality or otherwise, helps you through a dark period: fantastic! But we must reflect on how we discuss this link. People will struggle, and people will be creative. If those two groups overlap, then maybe it’s just a coincidence. 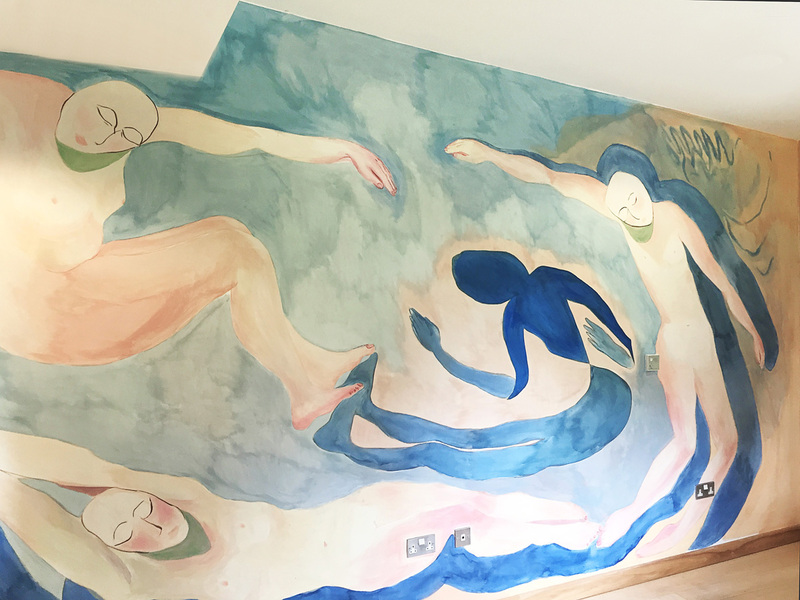 Artwork by Aimee Parrott, for the women’s lounge at Phoenix Unit – a secure psychiatric rehabilitation unit for people diagnosed with schizophrenia.